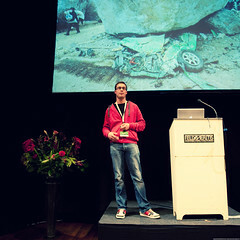 Fronteers is the Dutch organization for Front-end web developers. Since 2007 it has run regular meetings for members and non-members, and it also runs an annual conference that attracts speakers and delegates from all over the world. 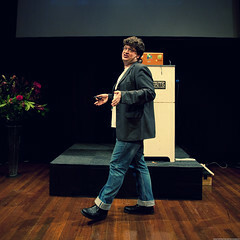 For some reason I didn’t blog about the 2008 conference, but here’s my report of the 2009 conference that took place at Felix Meritis in Amsterdam last week. It was a single-track conference with remarkably few beards present — I’d estimate that fewer than 10% of the men were sporting facial hair (even including soul patches), an extremely low figure for the tech industry. The speaker photos in this blog post were made by Marien Van Os (marvos on flickr), used under a Creative Commons license. (And also by permission — because it’s polite to ask.) Please go and have a look at his photos on 1pictureaday.com, because they’re amazing. Molly opened the conference with an overview of where “The Mobile Web” stands today, and what we can (and should) be doing to work with it. 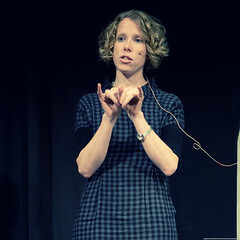 Her view is that the most practical strategy at the moment is to create a single site for both the mobile and desktop web (“desktop web” being the term that many of the speakers used to distinguish the “traditional” mode of accessing the web with a PC and a browser), but optimize the experience for the device. This means using things like server-side UA detection, CSS media types, capability detection, and CSS3 media queries to determine what the user is browsing with, and adjust the display accordingly. This certainly fits with existing best practices for accessibility, which emphasize progressive enhancement over graceful degradation; progressive enhancement for mobile devices can be treated as another branch of the same tree. Peter-Paul has recently been doing research into mobile browsers, and has published a ton of useful and interesting information on his site Quirksmode.org. 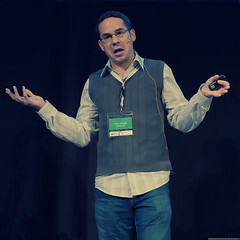 Here he talked about the mobile browser landscape, highlighting the fact that — at present — you have almost no hope of building a site that will render the same on all devices. In case you haven’t come across it before, YQL is a service from Yahoo! that allows you to run SQL-like statements on the web. Not as in, “here’s a web-based interface to a back-end SQL database”, but as in, “select * from flickr.photos.search where text="Cat" limit 10” to get a list of cat pictures from Flickr as XML, or as JSON with a callback (JSONP) so that you can get the results directly from client code, with no server-side proxy needed. If you haven’t tried it yet, just fire up the developer console and experiment with some of the sample queries. You don’t even need a developer key to get started, and run YQL queries from your own applications. 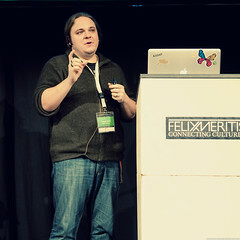 Stephen discussed the three competing layout modules currently under consideration for CSS3: CSS3-grid, CSS3-layout, and CSS3-flexbox. All three of these proposals allow you to specify a layout for your elements in CSS independent of the element source order — which means no more tedious mucking around with floats and negative margins to implement grid-based page designs. Unfortunately, the only native browser implementation that exists right now is CSS-flexbox in Firefox. There is a jQuery plugin that implements the CSS3-layout functionality, which is interesting. Stephen seemed to favour this proposal, and I like it, too. Your CSS effectively contains an ascii art representation of what the layout will look like. It’s a very visual representation, and is easy to explain and understand. Combined with CSS3 media queries (different than CSS2 media types), CSS3 layout will completely change how we provide support for multiple resolutions, media, and devices in our sites. 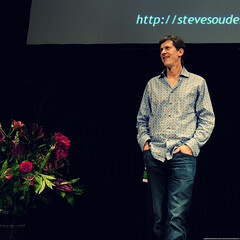 Steve Souders literally wrote the book on web site performance. (And its sequel, too.) 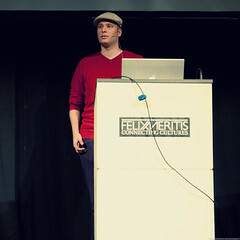 He created YSlow, Hammerhead, SpriteMe, and writes extensively about performance on his blog. 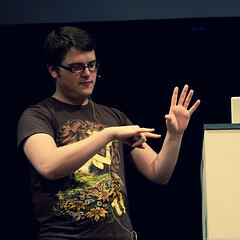 Front-end performance is a subject very close to my heart, and I was very excited that he was speaking at Fronteers this year. 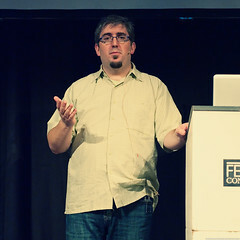 The theme of his talk was Fast By Default. There is a lot of research and information available that shows how much the perceived speed of a web site depends on front-end performance, and how much of an impact this speed (or lack of it) has on the bottom line for a business. So why don’t more businesses spend more time on it? Because it’s actually still quite hard. Steve highlighted several tools that can help with this, though. Aptimize Website Accelerator, for example, is a drop-in software solution that automatically applies optimizations like rolling up multiple JS and CSS files to reduce HTTP requests, minifying and gzipping JS and CSS resources, and spriting of CSS background images. WebPageTest.org, a web version of the AOL PageTest tool, gives extensive performance statistics and optimization tips for any page you choose to submit. ShowSlow.com uses showslow to collect and chart YSlow performance statistics over time, so you can see trends for your pages. SpriteMe, Steve’s own tool, analyzes a web page and gives you ready-made CSS sprites and sample CSS code to optimize your background images. 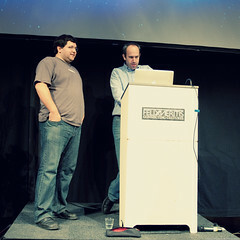 He also talked about progressive rendering, the techniques available for parallel downloading of script resources, and recent innovations in this area, such as reducing startup latency by putting script inside comments so that it the code isn’t parsed as soon as it is downloaded. Instead, you wait until the code is needed, remove the comment markers (/* */) and eval the whole block. 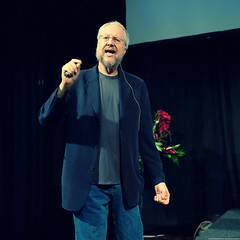 Douglas Crockford really knows how to weave a good narrative. He leads you through important and complex material with the grace of a great storyteller — his presentations often feel like documentary films. 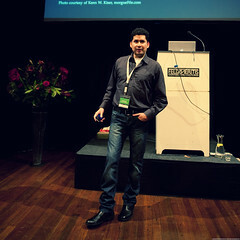 In this one, he talked about Ajax security. The advertising problem is serious. The publishers must go as one to the advertising industry and demand basic standards of ad quality. Afterwards, I was chatting with Martin Reurings and Sam Foster about this. One of the options we discussed was creating some kind of action group like the Web Standards Project (WaSP) to fight for sanity and standards in web adverts. (Might this even be grounds for another WaSP task force?) This has been going round in my head ever since, and I want to write more about it soon. If you have an interest in this subject, please leave a comment below. 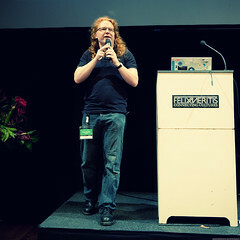 Pete spoke about some of the features available in IE8 that were not there in previous versions, such as mutable DOM properties, native JSON, and the selectors API. Not all strictly HTML5 features, but hey. He also highlighted the SuperPreview tool (part of the Expression Web suite) that allows you to preview web pages side-by side in various browsers, e.g. Firefox and IE8. It also has the IE6 rendering engine built in to it, so you can even use it to test IE6, IE7, and IE8 on the same machine, without resorting to unsupported hacks. This is very cool, and there is even a free version available (SuperPreview for IE), which is limited to comparing pages in the different versions of IE, but which is still very useful for doing compatibility work. Native web fonts are big right now. With the release of Firefox 3.5 earlier in 2009, we have reached a critical mass of browsers that support embedding of fonts with @font-face. Okay, so you have to have the font in several different formats (TTF, EOT, SVG) for it to render in all of the supportable browsers, but at least it’s possible. Well, technically, at least. There’s still that whole licensing issue. Jonathan has done a lot of research into web fonts recently, and in this presentation he took us through all the available options, from text replacement techniques (sIFR and Cufón), right up to WOFF support in Firefox 3.6. There are many different things to consider to get @font-face fonts to work correctly (and legally) on as many browsers as possible, but the results are lovely. Give it another year or so, and we’ll be wondering how we ever built sites without them. Xopus make a WYSIWIG XML editor for the web. It’s a big application — more than 120,000 lines of code in about 1,150 files — and Robbert talked about some of the challenges they have in getting it to perform well. For a user, the responsiveness of the application while typing is crucial: the browser cannot be allowed to freeze up while it is processing keystrokes, and the user must not have to pause typing just to let the browser catch up with what they have done. Xopus therefore makes extensive use of event handling queues, and chunked processing with setTimeout() calls to keep everything running smoothly. Because it is so small, Thomas was able to guide us through it line-by line in less than an hour. He clearly explained all the principles behind the effects that the library provides, and showed precisely how to implement them all. At each step he showed the problems that could arise, and what he did in code to circumvent them. The Emile library is a delightful piece of tight, elegant code; the presentation itself was a masterpiece of education. There are many CSS frameworks available that assist in setting up things like grids and typography, and many of these advocate some kind of “modular” approach, though what exactly “modular” means can vary. But all of these approaches are very hard to scale once you get up to sites (or applications) with tens, hundreds, or even thousands of different pages, layouts, or widgets. Knowing how to create cool new CSS3 gradients, rounded corners, and transitions is one thing; making that CSS re-usable, efficient, and maintainable and for a large-scale site is a whole different ball game. Nicole Sullivan reckons that modular CSS — in this context, taking “modular” to mean CSS specific to a visible block of content on a page — is fundamentally a mistake. I have often used exactly such a modular approach specifically to isolate modules from each other: if you want to change the styling of one module, you don’t run the risk of screwing up something else. As Nicole points out, however, this approach results in your CSS expanding linearly with the number and complexity of your modules, and does not allow for effective re-use of code, or good design consistency. 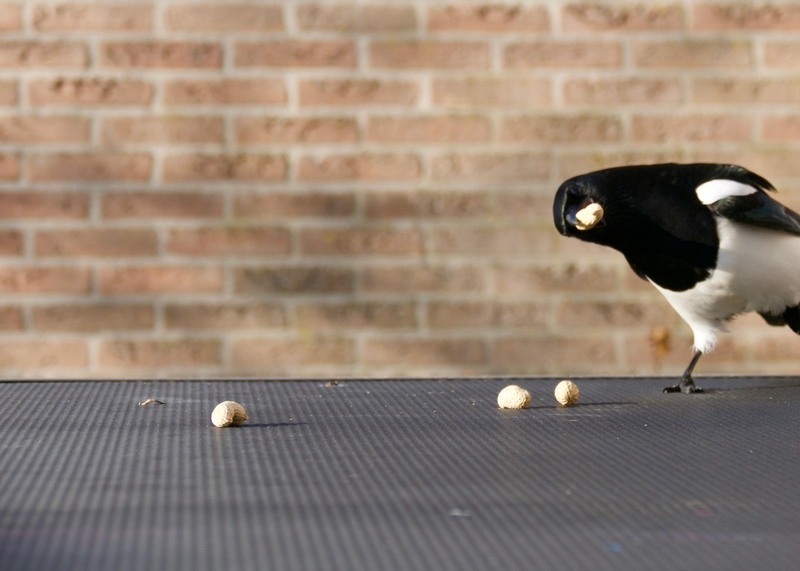 Object-oriented CSS is an approach that Nicole has been writing about for some time now. It’s a pattern for designing re-usable content modules by making better use of the CSS cascade. It’s the cascade, in conjunction with carefully structured HTML, that allows us to use object-oriented techniques like inheritance encapsulation for styling our HTML. To be honest, when I first started reading about OOCSS earlier this year I was skeptical, but I have gradually been coming round to it, and am starting to appreciate its subtlety and usefulness now. I’m not sure if it is the ultimate answer to creating effective CSS, but it is definitely an important piece of the puzzle. Poor Ben was really sick with the flu, and should have been in bed rather than on stage. But he made it all the way through to the end nonetheless, and they closed the conference with one of their classic inspirational rallies, guaranteed to leave you with a smile on your face and a spring in your step. They talked about all the things that excite them about the future of the web, such as canvas, GPU acceleration, and web workers, which will allow us to build applications that previously would only have been possible as platform native apps. “Mobile” featured heavily, of course, as it did throughout the conference. They are firmly convinced that the future lies with “devices” — not just mobile phones, but anything outside the traditional PC form factor. And I’m pretty sure they’re right. The biggest challenge ahead is going to be keeping “the web” as a flourishing common platform, and not allowing the device space to splinter into incompatible proprietary walled gardens. This isn’t a far-future challenge, either — it’s happening right now. 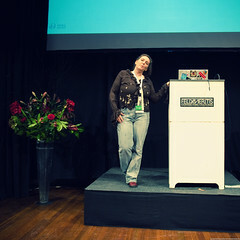 Fronteers 2009 was a fantastic conference. The quality of speakers and presentations was great, and the spectrum of technologies they covered was just right. There were plenty of opportunities for chat and networking, and even the lunchtime food was pretty good. (Long queues, but that’s only to be expected.) My thanks to all the organizers and volunteers who made it happen: great work, guys. I’ll definitely be there again next year.